The XXII. Plenary Meeting of the International Association „Coordinating Council on Trans-Siberian Transportation” supported by CER Cargo Holding. 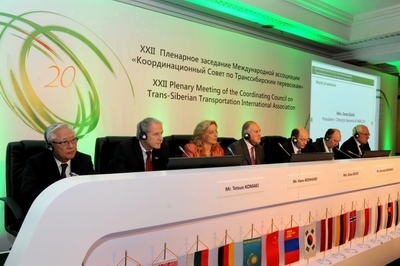 The plenary meeting of the transportation association (founded in 1993) Coordinating Council on Trans-Siberian Transportation, was being held in the Hungarian capital, which has the members of 105 from 25 countries. During the 2 days negotiations 250 delegated person took part, from 25 countries and were listening the presentation of CER Cargo Holding too. One of the main sponsor of the plenary meeting is CER group.